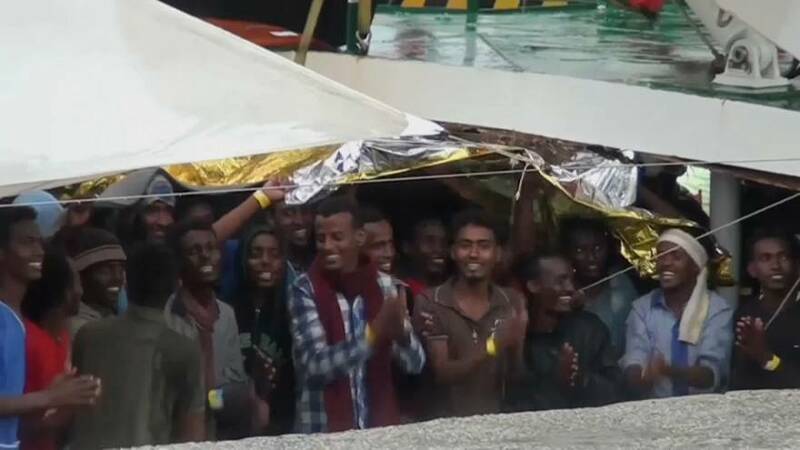 Hundreds of migrants sang, danced and cheered as they reached the port of Crotone in southern Italy on a NGO rescue ship. Three-hundred-and-thirty-nine of the migrants were rescued off the coast of Libya over the last few days, while the remaining were transferred onto the vessel from other boats. Riccardo Gatti, head of Proactiva Open Arms said the migrants were generally in good health. A further 400 migrants also landed in the port of Salerno this time rescued by a Spanish ship. Among the migrants, rescuers found the bodies of 26 women who has most likely been murdered. Around 600,000 migrants have reached Italy from north Africa since 2014. Meanwhile, migrants from a detention centre in Libya took part in a football tournament aimed at introducing a sense of normality to their lives. Most of the migrants arrived in Tripoli after their boats had been intercepted by Libya’s coastguard while trying to reach Europe. Dressed in matching jerseys and brand new rubber-soled shoes, migrants from Ghana and Ivory Coast took to the pitch in high spirits waving at their eager spectators.